It's time for a field trip with the science class! Taking a break from cracking the mutant genome and solving the present repopulation crisis, the X-Club (aka Xavier's pet science division) has been thrust into the heart of the field team's battle with Bastion. Tasked with sneaking aboard the enemy's mysterious oil rig and sabotaging it from within, the science team has inadvertently stepped right into a trap. Now, deep inside an unfamiliar stronghold that's outfitted with technology years from being discovered, they're watching an alarmingly short-fused timer swiftly count down to zero. Of course, the problem with dedicating an entire issue to resolving the team's ultimate fate is that we've already seen them leap to safety in X-Men Legacy #236. What could've possibly happened between "timer counting down to annihilation" and "leaping clear of a fireball" to fill out a full-length issue? Actually, quite a bit more than you'd think, although nearly all of it is immediately spoiled by a half-baked, telegraphed twist ending. This isn't to say it's a completely bad trip. Look past the craptastic climax and you'll find this is actually an unusually offbeat, interesting story, especially considering its location near the epicenter of the greater X-Men mythos. The X-Club is an entertaining mix of personalities and capabilities, a group that offers a more pragmatic, less plasma-blasting, adamantium-slashing answer to the kind of problems the X-Men have been facing for the last decade or so. Dr. Nemesis in particular gives the group a decidedly different flavor than I'm used to seeing from the X-Family, threading irony and sarcasm into his remarks so effortlessly it begins to resemble an entirely different language. 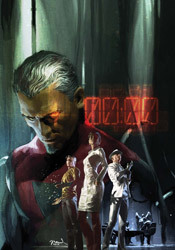 Writer Simon Spurrier may not nail the characters exactly as they've been seen in other titles, but he does maintain the group's fascinating dynamic and feeds them plenty of solid lines and unexpected problems throughout the issue. Paul Davidson and Francis Portela team up on this one shot's artwork, which varies wildly in subject and atmosphere from page to page. One panel may feature the sleek, clean backdrop of a sterile laboratory while the next overflows with decrepit, collapsed buildings, living shadows and constant strikes of static electricity. The two manage these sudden flying leaps decently enough, changing styles like an experienced bicyclist shifts gears on an incline. The dark treatment that coats most of the issue is its most successful, with a detailed, shadow-hazed look demanding immediate comparisons to Jae Lee, but it's also missing a beating heart. Each member of the team comes off as a stiff, soulless marionette, posed for the scene but looking and feeling more than a little bit unnatural. That's not enough to spoil the fine work that's done on scenery and composition, but it does take away from an effort that's otherwise quite strong. Blind Science is nothing if it's not inventive. Simon Spurrier's fever dream of the club in an unusual post-apocalyptic setting is a fully functional mind dump that yields a frequent, fruitful harvest. Just don't expect it to answer any questions or reveal any new information about the team, their actions during the crisis, or the X-Men as a whole. This is a fully self-indulgent fantasy, and nothing is out of bounds... even contradicting itself at the end of the third act. It's a good time, but most readers will find themselves too busy feeling betrayed by the ending to realize that. Flip through it.